Got White Ants in Hobart? Get professional, effective white ant treatment today. Call Jim’s Pest Control Hobart for a free Quote; or Book Online 24/7. Our Experienced, fully Licensed and Qualified Technical Advisors can provide a range of White Ant Treatment and Management plans to suit. Whether you have found a white ant nest, or can see signs of white ants damage to your property, garden or home, we are confident we can help eradicate them, and permanently. Many people are not sure if they should buy a home with evidence of termite activity; either current or previous, but White Ants can be eradicated if a professionally managed treatment program is adhered to. 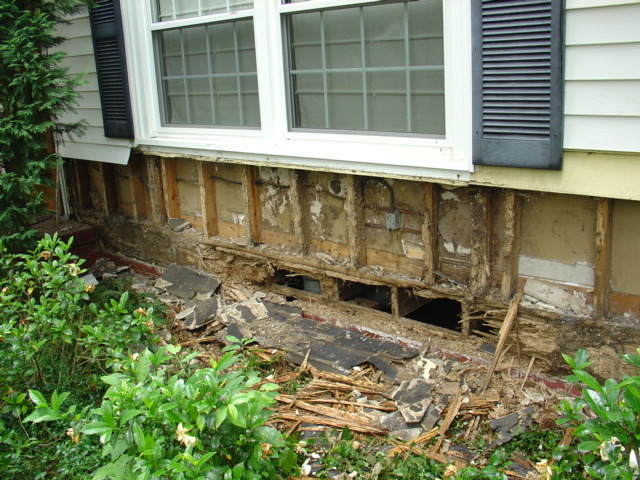 While some damage may not be immediately obvious, and a budge should be allocated for such repairs, once repairs are done, the white ants can be kept at bay; and repeat infestations can be prevented. Clear signs of white ant damage to the sub-frame of this Sydney home. Our experienced team can provide advise on Remedial Treatment to address current termite infestations; and how to get rid of termites. And of course also provide information on White Ant Prevention Programmes to keep them from coming back; keeping your property fully protected. And while treatment options will vary according to climate, building materials, and other physical factors, rest assured that our White Ant Treatment offers a 100% satisfaction guarantee. That’s what you get with Jim’s Pest Control – our team are all fully trained, qualified and Licensed Pest Control Specialists. Remember, do not risk using unlicensed or unprofessional white ant control services. Pest control is a specialist field, requiring full accreditation and licensing. Ask to view your pest controllers license, insurance and qualifications before letting them commence any treatments. Often chemical treatments can result in serious sickness, injury or even death if not fully compliant with Australia’s strict OH&S standards. For Same Day White Ant Treatment, book in the local Jim’s Pest Control Hobart team today. Just Call 131 546 or Book Online here.